Are you interested in volunteering in the community? Circle K International is a global, student-led organization with opportunities for service at all interest levels and flexible times that can fit anyone’s schedule. Our University of Illinois chapter participates in a variety of service events from volunteering with children at local libraries and the Orpheum Museum to participating in wider community projects like iHelp and the CarX Crazy K. We also have upcoming leadership opportunities! If you are interested in serving with us, come to our next meeting Wednesday, February 10th at 7:00pm in 1060 Lincoln Hall. We can’t wait to see you there! Illinois Big Data Group is hosting the director of data analytics from PwC for a talk on an overview of Technology Consulting and Data Analytics at PwC and how professionals use Data Analytics in their careers. Everyone is welcome to come. 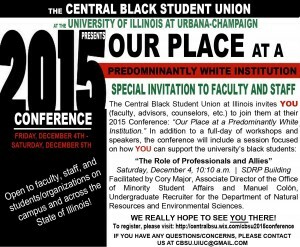 The Central Black Student Union at Illinois invites YOU (faculty, advisors, counselors, etc.) 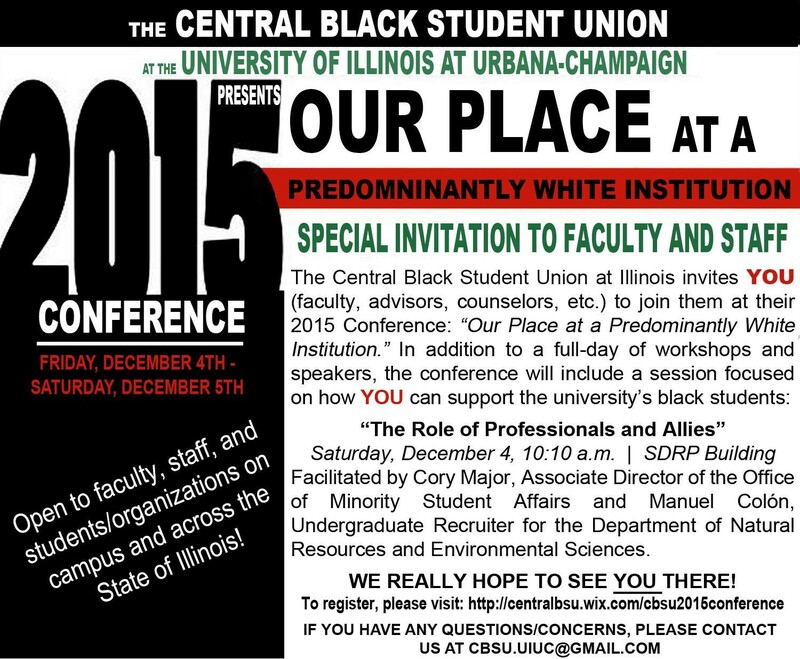 to join them at their 2015 Conference: “Our Place at a Predominantly White Institution”. In addition to full-day workshops and speakers, the conference will include a session on how YOU can support the university’s black students. Facilitated by Cory Major, Associate Director of the Office of Minority Student Affairs, and Manuel Colón, Undergraduate Recruiter for the Department of Natural Resources and Environmental Sciences. I am writing to remind you about our program’s open house on Wednesday, September 30 at 4:00pm in the Jewish Studies office (109 English Building). We’ll have pizza from Papa John’s and look forward to seeing you. How to Get Involved in Research at UIUC: Come join Research as Students at Illinois (RSI) for their informational event on how to get involved in undergraduate research on campus! We will walk you through how to narrow down your research focus, find potential professors to work with, and what to expect once you find a lab. The meeting will take place during Undergraduate Research Week on April 16th at 6:30 PM in Noyes 217. Contact – John, ResearchStudentsIllinois@gmail.com. For more information, find us on Facebook. Here’s an announcement from the Innovation Immersion Program that you might be interested in. Contact them for more details. We are part of an entrepreneurial, student-led technology consulting organization called the Innovation Immersion Program (http://iipillinois.com). We give Illinois students professional networking opportunities and hands-on consulting experience in global technology hubs. Our student consultants work in international teams with students from Israel, Sweden, and Singapore to complete strategy projects for international firms. We will likely have a booth at the Spring Organization fair next semester, so if you believe your students would be interested in IIP, please feel free to contact us. Next semester, we will complete consulting projects for major technology firms in Singapore and Taiwan, which includes a Spring Break immersion trip to Singapore and Taiwan for participating students! We are currently recruiting Illinois undergraduate and graduate students from diverse disciplines such as Engineering, Business, Media, and Library Science to join our Spring 2014 consultant teams. Our application is currently open and can be completed online at https://illinois.edu/fb/sec/1649346. Applications will be considered on a rolling basis until November 8th. At that time we will contact applicants for an interview. To get a glimpse of what it is like to work on our international project teams and participate in an IIP immersion trip, please view our latest video about last year’s Israeli project cycle, which was filmed in Israel: http://youtu.be/96iW6yz-_8w. Feel free to reach out to innovationimmersionprogram@gmail.com for any questions regarding recruitment for our Spring 2013 project cycle in Singapore and Taiwan. We are excited to bring a new cohort of talented LAS, Engineering, Business and Law students to IIP, and we look forward to hearing from you! Illini Statistics is sponsoring a presentation by Chris Lalla and John Obenland from Zurich North American on Monday, November 4th at 5:00 pm in 1090 Lincoln Hall. Zurich is a world-wide insurance company offering high quality insurance services to its customers. Chris and John will introduce the Zurich culture and how statistics is applied in the real business world. They are happy to answer any question concerning to the relative fields. Thank you. Please join Illini Statistics Club on Tuesday, September 17 at 5pm for our first event. It will be a picnic at Scott Park on 3rd and Healey. We will be serving food, passing out important information, and registering new members. Everyone is welcome! Following the meeting, we will relocate to Murphy’s Pub at 5pm for a social hour. Women in Science is an RSO on campus with the purpose of supporting women in science by helping them reach their career goals and fostering a community for women in scientific fields. This group is open to all students, postdocs, and faculty, both male and female, on the UIUC campus who support women in science.